88 Fortunes is a 5 reel, 243 payline slot game with a 96% RTP. Touch coin to reveal Fu Baby. Match 3 Fu babies to award jackpot. Developed by Scientific Gaming, 88 fortunes is a slot built on the concept of luck. The number 8 is taken as a very lucky number in Chinese culture and those who are in possession in something that amounts to 8 are termed very lucky people. This slots game has a lot of fun and entertainment that lies in wait for you. It will take you to an underground Chinese club where the red colour is dominating and money is all over the screen. Scientific Games has a huge fan following due to its creative and innovative slot games. It has several other titles similar to 88 Fortunes such as Feng Fu slot game, Emerald City, OMG kittens etc. You will be seeing different items and ornaments on the screen that are related to the Chinese culture. The screen is a very colourful and unlike screens of other slot games, it is very colourful and offers attractive features for the players. The items and colours chosen for this game uplift the graphics and the visual appeal because they offer a stunning insight into the Chinese culture. 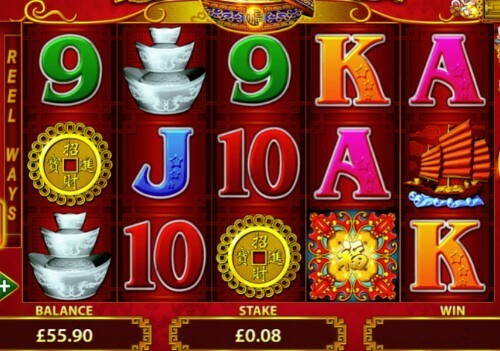 Statistically there are numerous slot games based on the Chinese culture but this one is unique in terms of its theme and the colourful features that it offers to the players. You will enjoy the rich theme of this slot because it is full of colours and different opportunities to win. If 8 is your lucky number then be ready be ready because this game is all about lucky numbers especially 8 from which it derives its title. Chinese culture has always had a strong belief in luck and other related things to luck. So try to conquer your own luck in this game and see if you can earn some wins. Play this slot game on Money Reels to find out if 8 is your lucky number or not. This game offers an RTP of 95.93% with 5 reels and 243 paylines. £0.08 and £88 are the limits of coin value change. The theme and focus of this game is around eastern culture i.e. Chinese. You will be coming across a theme, background and screen that is strongly influenced by the Chinese culture in all aspects. The music in the background is purely Chinese and adds a lot of fun to the gameplay, it give you the feeling of being present in a Chinese club. Try to conquer your luck in this game by using your lucky number. Luck is a variable that many have tried to conquer but only few have mastered the art of familiarizing themselves with their luck. You will feel that this game is all about it and the wins that win in this slot will be pure luck. The genre of this Chinese slot is Asian. Background of the slot game shows a red Chinese carpet with different drawings in a thing beautiful golden colour. There are different beautiful frames on the screen each holding a different section of the slot game. The top section holds the game’s title with cute drawings of two babies of different genders each holding an inscription. The right section shows the jackpot value, the left section holds the gold symbol values, the bottom section holds the monetary value whereas the centre section holds the slot box. The sections are evenly divided on the screen giving it a very attractive and professional look. Slot box is merged with the background and there is no clear border. There are random Chinese art inscriptions on the screen in golden colour. The interactive buttons are placed in the bottom right corner of the screen. The lower valued symbols of this slot are J,K,Q,A,9 and 10 where as the higher valued symbols are a bird ,a ship ,a golden turtle, a pile of ingots and the Chinese dollar. Extra symbols which make this slot more fun are the wild symbol i.e. depicted by Fu Bat symbol which can replace all other symbols. Another extra symbol is the Gong bonus symbol which is used in activating bonus features. Too tired to this Chinese adventure into this red themed club? Why not try the Autoplay mode? Turn it on and enjoy the perks of automated technology. There are two main bonus features of this game which will leave your pockets dripping with coins and will make you come again to this Chinese club. If you are able to land a minimum of 3x gong bonus symbols on the screen then this will grant you ten free spins. These free spins can be retriggered by the player. This feature is triggered if the player manages to land a Fu bat bonus symbol on the screen. This is a rare symbol so be on the lookout. If you are able to land it then you might be taken to another screen where you will be asked to select from a shown number of coins, you will have to select the coins and if turns out to be three matching symbols then you might be rewarded with one of the four available jackpot prizes i.e. Grand , Major , Minor and Mini.